"We've been interested for a long time in trying to understand the factors that affect variation in mutation rates across the genome," said Kateryna Makova, Pentz Professor of Biology at Penn State and one of the leaders of the research team. "Sequences that can form non-B DNA, which form structures other than the common right-handed double-helix with ten bases per turn (B-DNA), make up about 13 percent of the human genome and play many important roles in cellular functions, including gene regulation and the protection of telomeres–the sequences that cap and stabilize the ends of chromosomes. Because these regions are also associated with many human diseases we were interested to see if they had any impact on the speed of the DNA synthesis reaction–also called "polymerization"–and on its error rates." Non-B DNA includes sequences with runs of the "G" nucleotide, guanine, which can form G-quadruplex structures; "A"-rich regions, which can cause helix bending; and short tandem repeats–regions with the same one-to-six nucleotide motifs repeated over and over again (e.g. GATA GATA GATA …)–that can form slipped strands and hairpins. Using Single-Molecule-Real-Time sequencing, or SMRT, which tracks the time between the incorporation of each successive nucleotide (the A, T, C, or G building blocks of DNA), during sequencing, the researchers compared regions of non-B DNA to B-DNA. "There are hundreds of thousands of sequence motifs that are predicted to form non-B DNA across the genome," said Wilfried Guiblet, a graduate student in the bioinformatics and genomics program at Penn State and co-first author of the paper. "We used data from the SMRT sequencer from Pacific Biosciences to compare the nucleotide incorporation times along non-B DNA regions with those along regions of more common B-DNA." 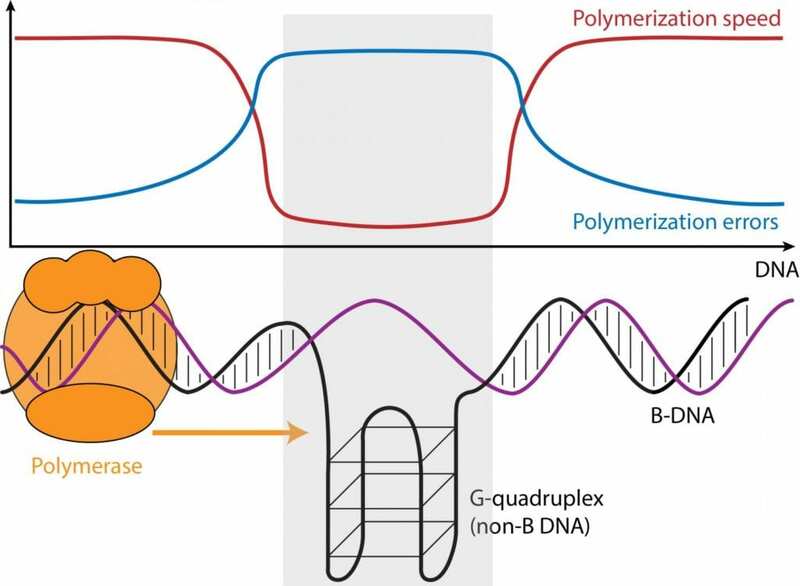 The comparison revealed that some forms of non-B DNA–G-quadruplexes, for example–caused the polymerase enzyme to slow down by as much as 70 percent, while other non-B DNA caused the enzyme to speed up.